Searching for the fountain of youth? 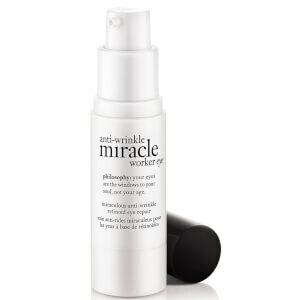 Skincare wellbeing specialists philosophy present the next best thing – Time in a Bottle 100% In Control Serum. Targeting the past, present and future condition of your skin, the pioneering anti-ageing treatment helps repair pre-existing damage, combat environmental aggressors and activate skin’s natural age-resist function with extracts of Himalayan Red Rice and Red Grape to unveil revitalized and younger looking skin. Utilizing dynamic three-dimensional technology and an exclusive Liposome Complex, the lightweight formula stimulates cellular renewal to help heal damage at the source, while a patented antioxidant complex fights free radicals and pollutants that can cause premature ageing. An innovative ‘fresh pour’ two-phase system ensures maximum potency of ingredients, delivering instant and long term results you can see and feel, with skin looking smoother, refined and firmer with the appearance of fine lines and wrinkles significantly reduced. Use morning and/or evening after cleansing. 1. Pour the entire vial of high-potency vitamin c8 activator into the serum, and fasten pump to the bottle. 2. Shake well for 20 seconds. The serum will turn light pink, indicating it is ready to begin transforming your skin. Use within 3 months after mixing for best results. Serum: Aqua/Water/Eau, Dimethicone, BIS-PEG-18 Methyl Ether Dimethyl Silane, Cyclopentasiloxane, PEG-8, Alcohol Denat., Butylene Glycol, Glycerin, Dimethiconol, Polyethylene, Xantham Gum, Phenoxyethanol, Benzophenone-4, Bifida Ferment Lysate, PTFE, Caprylyl Glycol, 1, 2-Hexanediol, Propylene Glycol, Hydroxyethyl Acrylate/Sodium Acryloyldimethyl Taurate Copolymer, Squalane, Plantago Lanceolata Leaf Extract, Disodium Edta, Caprylic/Capric Triglyceride, Parfum/Fragrance, Silica Dimethyl Silylate, Sodium Hydroxide, Adenosine, Physalis Pubescens Fruit Juice, Lecithin, Polysorbate 60, Alcohol, Tocopherol, Acrylates/C10-30 Alkyl Acrylate Crosspolymer, Silica, Hydrolyzed Soy Flour, Citric Acid, Sodium Phosphate, BHT, Sodium Chloride, Ascorbyl Palmitate, Camellia Sinensis Leaf Extract, Coffea Arabica (Coffee) Seed Extract, Pongamia Pinnata Seed Extract, Punica Granatum Fruit Extract, Bacillus Ferment, Linalool, Sodium Benzoate, Angelica Archangelica Root Extract, Citrus Aurantium Amara (Bitter Orange) Peel Extract, Maltodextrin, Hydrolyzed Vegetable Protein, Trisodium Edta, Magnesium Aluminum Silicate, Acetic Acid, Potassium Chloride, Potassium Phosphate, Ascorbic Acid, Lactic Acid, Sclerotium Gum, Plankton Extract, Micrococcus Lysate, Sorbic Acid, Retinyl Palmitate, Titanium Dioxide (CI 77891), Mica. Activator: Propanediol, 3-O-Ethyl Ascorbic Acid, Alcohol Denat., Aqua/Water/Eau, Oryza Sativa (Rice) Extract, Benzophenone-4, Phenoxyethanol, Saccharomyces/Grape Ferment Extract, Adenosine, Fd&C Red No. 4 (Ci 14700), D&C Green No. 5 (Ci 61570).